The Eggnog Martini may be the answer if you find eggnog too rich or you want something a little stronger. 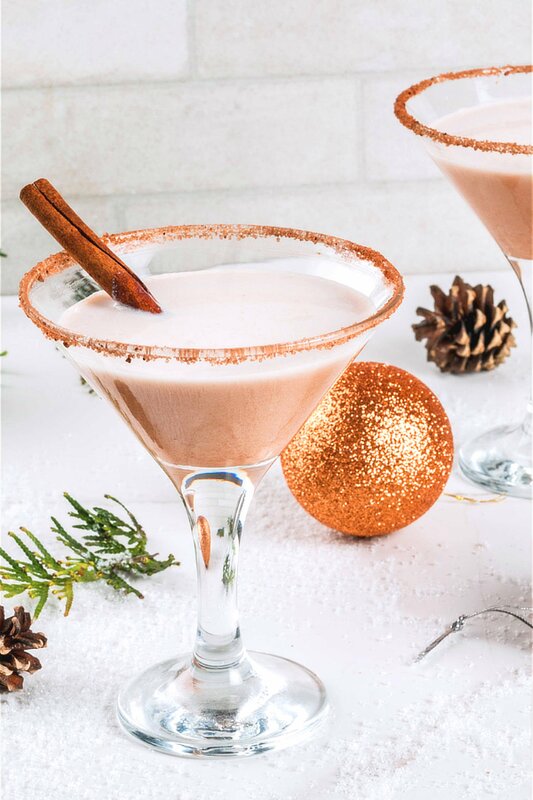 This drink takes eggnog to the next level with the addition of vanilla vodka and amaretto for a rich, sweet, delicious treat. Eggnog is incredibly rich. That’s exactly what some people love about it – it can almost replace a meal with all that egg built in. But if that’s exactly what you don’t like about it, then the Eggnog Martini is for you. It starts with two and a half ounces of eggnog (with or without rum – your choice), and to that it adds some vanilla vodka and amaretto. The result is a cocktail that tastes and feels so much lighter than eggnog, but still retains that eggnog flavor. The vanilla and the amaretto add to that flavor without changing it very much. The taste of this rim is a wonderful combination of brown sugar and caramel – sweet and rich. It’s delicious on its own, but when you taste the drink along with it, it’s just heavenly. This is a great cocktail to serve at parties and small get-togethers, too. It’s easy to make up in big batches in advance of a party so you don’t have to be mixing drinks while you’re entertaining. And there are a couple of ways to go about serving it. You can make your pitchers in advance. Go ahead and rim the glasses and put the cinnamon sticks in them. Pour the drinks from the pitcher when guests arrive and refill as needed. Or you could make the first round of drinks early, stick them in the refrigerator, and then use the pitcher you made in advance for refills. You can also just skip the rim decoration and the cinnamon stick altogether. This is ideal if you’re entertaining quite a few people and you want to keep it simple. If people are going to be standing a lot, they don’t want to be fiddling with cinnamon sticks when they try to take a drink. If you feel like the drinks look too plain, sprinkle powdered cinnamon on the tops of them. It looks beautiful and like you’ve really thought through all the details. When serving it with food, the trick is to keep the foods light because the drink is rich. Finger foods like caprese salad skewers or vegetables with curry dip keep it light and easy. For a meal, try an entree salad or something like garlic shrimp and asparagus. The Eggnog Martini is a wonderful drink to enjoy on a cold winter evening. Even though the drink itself is cold, the spices and amaretto are comforting and soothing. It makes a great dessert drink, partly because of the sweetness and the flavors. It’s also a little bit filling because of the small amount of eggnog. The Eggnog Martini recipe takes ordinary eggnog and mixes it with vanilla vodka, amaretto and more. The result is a lighter version of eggnog with a wonderful flavor. Fill a shaker with ice and pour in the eggnog, vodka and amaretto, and shake until chilled. Rim a chilled martini glass with a mixture of caramel syrup and brown sugar (you can either pour both on a saucer and rub the glass in them, or dip the glass into the caramel syrup from one saucer and the brown sugar in another if you're struggling to get it to stick). Strain the mixture into martini glass, and garnish with a cinnamon stick. Do you have the “Pitcher” recipe? It depends what size pitcher you’re using. You just multiply the ingredients, as described here: https://mixthatdrink.com/entertainment-tip-mixing-multiple-drinks/. Works for any drink! If you’re doing half a gallon, for example, I’d suggest 30 ounces of eggnog, 12 of vanilla vodka, and 12 of amaretto.